(Nanowerk News) Most robots on a factory floor are fairly ham-handed: Equipped with large pincers or claws, they are designed to perform simple maneuvers, such as grabbing an object, and placing it somewhere else in an assembly line. More complex movements, such as adjusting the grasp on an object, are still out of reach for many industrial robots. Engineers at MIT have now hit upon a way to impart more dexterity to simple robotic grippers: using the environment as a helping hand. The team, led by Alberto Rodriguez, an assistant professor of mechanical engineering, and graduate student Nikhil Chavan-Dafle, has developed a model that predicts the force with which a robotic gripper needs to push against various fixtures in the environment in order to adjust its grasp on an object. 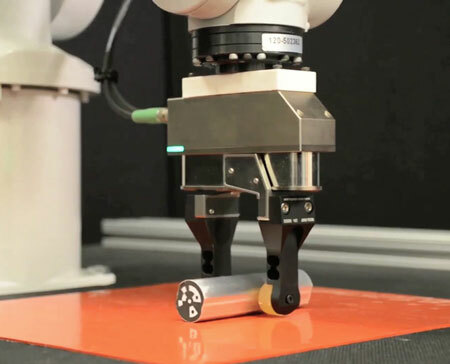 For instance, if a robotic gripper aims to pick up a pencil at its midpoint, but instead grabs hold of the eraser end, it could use the environment to adjust its grasp. Instead of releasing the pencil and trying again, Rodriguez’s model enables a robot to loosen its grip slightly, and push the pencil against a nearby wall, just enough to slide the robot’s gripper closer to the pencil’s midpoint. Partnering robots with the environment to improve dexterity is an approach Rodriguez calls “extrinsic dexterity” — as opposed to the intrinsic dexterity of, say, the human hand. To adjust one’s grip on a pencil in a similar fashion, a person, using one hand, could simply spider-crawl her fingers towards the center of the pencil. But programming such intrinsic dexterity in a robotic hand is extremely tricky, significantly raising a robot’s cost. With Rodriguez’s new approach, existing robots in manufacturing, medicine, disaster response, and other gripper-based applications may interact with the environment, in a cost-effective way, to perform more complex maneuvers. Rodriguez and Chavan-Dafle will present a paper detailing their new approach in September at the International Conference on Intelligent Robotics and Systems. Rodriguez is currently exploring multiple ways in which the environment may be exploited to increase the dexterity of simple robotic grippers. In ongoing work, his group is looking for ways in which a robot might use gravity to toss and catch an object, as well as how surfaces like a tabletop may help a robot roll an object between its fingers. In this most recent paper, the group investigates an approach to extrinsic dexterity called “prehensile pushing” — exploiting fixtures in the environment to manipulate a grasped object. The researchers developed a model that describes the forceful interaction between a gripper, a grasped object, and different types of external fixtures such as corners, edges, or surfaces. To predict how an object may move as a gripper pushes it against a given fixture, the researchers designed the model to take into account various factors, including the frictional forces between the gripper and the object, and between the object and the environment, as well as the object’s mass, inertia, and shape. In its current iteration, the model predicts the force a gripper must exert, on the object and the environment, to maneuver the object to a desired orientation. For instance, how tight should a robot grip a bar, and how hard must it push that bar against a point, to rotate the bar 45 degrees? Rodriguez and Chavan-Dafle tested the model’s predictions against actual experiments, using a simple two-fingered gripper to manipulate a short rod, either rolling, pivoting, or sliding it against three fixtures: a point, a line, and a plane. The team measured the forces the robot exerted to maneuver the rod into the desired orientations, and compared the experimental forces with the model’s predicted forces. Ultimately, Rodriguez sees extrinsic dexterity as an inexpensive way to make simple robots more nimble for a variety of uses: A surgical robot may push a scalpel against an operating table to adjust its grip, while a forensic robot in the field may angle a piece of evidence against a nearby rock to better examine it.